This information can be very important for repair shops and owners of vehicles that are registered in states that conduct routine checks of the Diesel Readiness Status during their Smog Checks and/or Car Inspections. It also important to note that when the codes are cleared, this will reset the readiness bits and in order to reset the Clean Diesel Readiness Status it may be necessary to perform extended road tests or driving cycles. Setting the readiness bits for the DPF will require at least one DPF regeneration cycle. This Readiness information can be found in the [01-Engine] Measuring Value Blocks in the form of binary data. Below is a guide that will help you to read and understand the binary data. 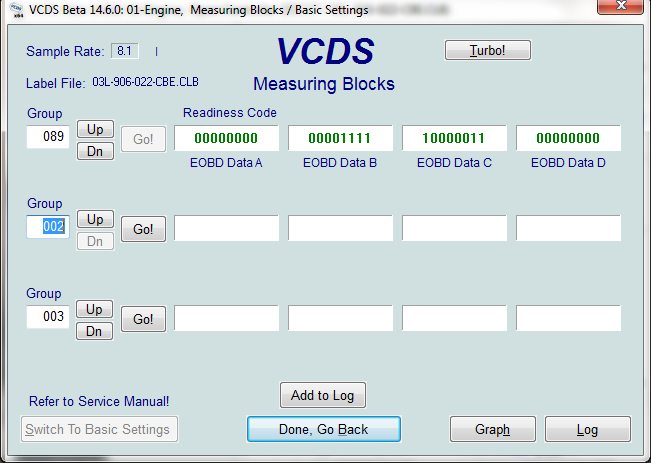 Readiness Status using the OBD-II function of the Ross-Tech scan tool. Last edited by DrPeter; 06-27-2014 at 01:01 PM. Just to add (since we have gotten a few inquiries lately), we have not found any way to use a scan tool to make these types of engine controllers set readiness in the bay. Instead actual drive cycle(s) would be required. Sorry, no readiness scripts for these. Also if you live in a state where diesel vehicles are required to have emissions testing then this link may help. Last edited by Andy; 02-06-2015 at 02:55 PM. It's only a clean diesel test if it's in the actual test mode to run the tests. Can you find the hidden block or basic setting test......? Time to visit the negative one water world. Have you ever wondered why this bit for this specific test won't run while in dirty mode...... taking forever? Further ever wonder why this test is not displayed in readiness screen, however, does on the OBD2 side? These non UDS cars can run direct basic setting tests for readiness bits; or tests observed on a road test, or to see the drive cycle if in "clean mode" in blocks. Non UDS cars do run a dedicated script basic settings test,........ and test counts are added if in clean mode. VCDS testers "push" on adventurer .......your quest awaits for the Holy cup filled with soot. The following blocks can commence for TP2.0 TDI for readiness. 0x01-04-200 >204 and 220>224 with no security login needed in basic settings. Could you elaborate the procedure for us newbs? I tried going in basic settings and entering 200-204 in the field and didn't see anything useful. I'm currently fighting to get at least two of the three remainig monitors to clear on my wife's 2010 TDI - 'Catalyst Monitor', 'Heated Catalyst Monitor' and 'Oxygen Sensor Monitor' (Which near as I can tell are actually 'NMHC catalyst Monitor', 'NOx/SCR Aftertreatment Monitor' and 'Exhaust Gas Sensor Monitor', respectively). I went into basic settings, and into each block you specified, and I got the attached results. Not sure what should be done here, and have no idea what is what.... I FINALLY got another monitor to clear , so I'm down to 'Catalyst monitoring' and 'Oxygen sensor monitoring' not complete... Since there doesn't seem to be any indication what block is what, or really what to do, if those blocks are something to help get these monitors to set ready, not knowing which is which and not knowing what actually needs to be done, the info doesn't really help... NORMALLY, I'd be game for messing around and seeing what is what, but I have been trying to get the monitors to complete since June, and my wifes cars reg is now expired due to the emissions failing (we took it in for inspection, pretty much knowing it would fail emissions, so we have the failure paperwork and thus some cushion with the law), so I want to get it to all ready so it'll pass (the law says one not ready is ok, and I'd be fine with that, but I've been told by a local person that's familiar with VW diesels that apparently even one not ready will fail a diesel) and we can get it renewed, and I really don't want to screw it up. Any advice? Basic setting "TESTS" are only good if you actually have the test set to "ON" and you also need to have a brake and gas pedal pressed with a remote take over for these tests to perform the macro. Find the additional hidden portals..........Get the DHD and ZPM.........then dial the area code extension chevron to Atlantis. Last edited by Jack@European_Parts; 08-06-2016 at 10:04 AM. Right - I was just looking to see what came up so I could see if there was anything that would indicate what each test did. Since I have no idea what does what, I don't want to just play with things and risk messing up the monitors that have completed.